My kids got into Minecraft a long time ago. It’s been so long now that I can’t remember a time when they didn’t play it. At first, I was concerned that they were spending too much time mining and building, but, the more I watched, the more I realized that they were actually learning valuable skills – like problem solving. 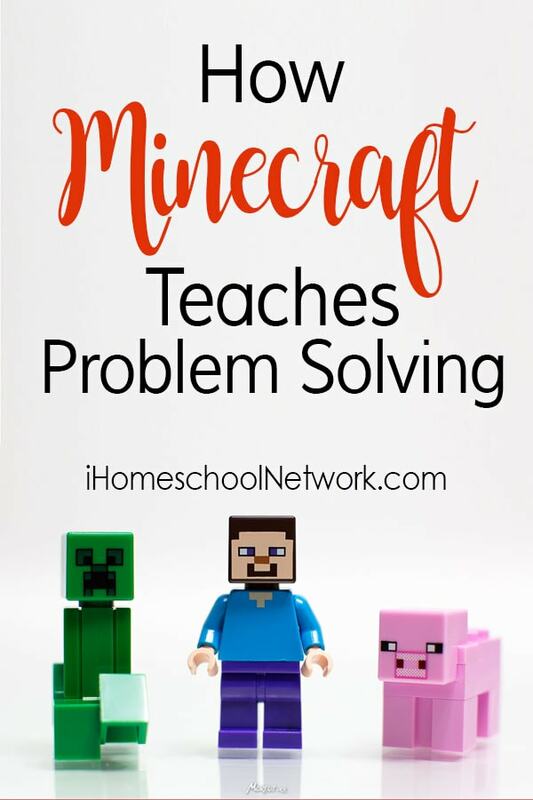 I’ve written before about how we use Minecraft in homeschooling and some of the ways we incorporate it into our lessons, but the biggest impact it’s had is that Minecraft creates problem solvers. One of the things I absolutely love about homeschooling is that it has afforded us the opportunity to be a bit unconventional. Instead of relying strictly on a rigid curriculum, we’ve been able to do a lot of student-led interest activities. For each of my kids, Minecraft played a huge role in that. The thing about Minecraft is that everyone starts off with the same basic issues. There’s a lack of shelter, a need for food, and a desire to explore. Priorities must be placed on the most basic of tasks first or the character won’t survive. How, for example, do you go about building a house? How do you create doors? How do you gather food and which animals are okay to eat? Is it better to build near the water or in a forest? Where are the best places to mine? How can you create new things? Players have to problem solve and figure things out. Sure, they can watch “cheat” videos on how to build or create things, but they still have to implement the actions themselves. I would even argue that looking up how to create something is problem solving in and of itself! Minecraft, by its very nature, relies on players’ creativity and problem-solving skills. It requires them to use their imaginations and then figure out how to make things happen. While the game may be abstract, the need to problem solve to play it is very real. The fact that players can test theories, try new things, experience failure in a safe way, and go on to test theories time and again, is priceless. It teaches them that failure is not the end of the world and that when you try things a different way or with a different material, you might just achieve your goals. My kids have always enjoyed playing Minecraft alone, but they also love to play together. They have played with friends in other towns, cousins across the country, and even a friend who lived on the opposite side of the world. The ability to work together as a team has helped them develop their verbal communication and problem-solving skills better than anything else they’ve ever tried. They also have a lot more fun doing it! Minecraft may not be every family’s cup of tea, but for my kids it has provided an outlet for self-expression and creativity. It’s taught them to think outside of the box when problem solving and made it fun to find new ways to do things. In fact, I would even credit it as the driving force behind my son’s desire to build his own gaming computer at the age of 13. If building your own computer doesn’t take a hefty dose of problem solving skills, I don’t know what does! Here’s hoping that Minecraft encourages your children as much as it has mine. Parent Tip: For tips on how to set up your own Minecraft server, check out this helpful guide! It’s a lot easier than you think! Brandi Jordan is a teacher, homeschooler, and NASM Certified Personal Trainer and Youth Exercise Specialist. She is also a freelance social media marketer, writer, and graphic designer. When not creating pretty things for ThatKidsCraftSite.com or hanging with her family, she can be found curled up with a good book and a cup of tea.